President Bush is hopeful that after talks with Saudi King Abdullah OPEC will authorize an increase in oil production to ease pressure on prices. White House press secretary Dana Perino said Wednesday that Mr. Bush brought up the subject of high gas prices, and their negative effect on world economies, after having dinner with the king Tuesday night in Saudi Arabia. "The president said there's a hope, as a result of these conversations, that OPEC would be encouraged to authorize an increase in production," Perino told reporters on Air Force One before it landed in Egypt. The White House would not provide more details about Mr. Bush's conversations with the king. "Obviously, it was a private conversation," she said. "We are reluctant to provide a readout of them." The president reiterated the issue of there being tight supply and very high and rising demand not just in America but around the world, especially in India and China, Perino said. "This is not a situation that is going to be solved overnight, and that's why the president has been pursuing aggressively alternative and renewable forms of energy," she said. Mr. Bush arrived in Sharm el-Sheik on a warm sunny day and was greeted at the bottom of the stairs of Air Force One by Egyptian President Hosni Mubarak. Egypt is the final stop on Mr. Bush's eight-day Mideast trip. CBS News White House correspondent Peter Maer reports Mr. Bush arrived with the backdrop of "a rough patch in U.S.-Egyptian relations". At issue, says Maer, are American allegations that weapons and fighters have been smuggled into the Gaza Strip, held by militant group Hamas, via an Egyptian border crossing. Another strain on the relationship has been Mr. Bush's recent, public voicing of concerns over Egypt's human rights record, adds Maer. The administration has been dismayed as hopes faded for a democratic swell in Egypt, but Mr. Bush's visit provided evidence of a pulse of political dissent. Protesters who don't like Egypt's authoritarian government went into the streets to say they don't like the American president, either. Mr. Bush was paying a brief call on a historically important ally amid tension over Egypt's jailing of a political opponent and other democratic contractions. The three-hour, all-business visit contrasted with two days of compliments and colorful cultural diplomacy in Saudi Arabia. 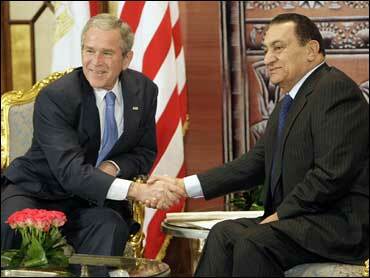 Renewed Mideast peace talks will be a main topic of talks between Mr. Bush and Mubarak. Egypt, one of only two Arab states to broker peace with Israel, had urged Mr. Bush to do more to resolve the Palestinian conflict with Israel. Dozens demonstrated in the capital Cairo on Tuesday at a protest called by Egypt's most powerful opposition group, the banned Muslim Brotherhood. "We as Egyptian citizens meet today on behalf of the Egyptian people, regardless of the official Egyptian stance," in hosting Mr. Bush, said Mohammed El Belgati, a representative of the Brotherhood. "We totally refuse this visit because George W. Bush only brought destruction, killing, distress and displacing in Iraq, Afghanistan, and Palestine." Tuesday's demonstration was small, but the Muslim Brotherhood is popular. It has outlasted a secular opposition group called Kifaya, or "Enough," that flowered three years ago but is now in disarray. Its durability is awkward for the Bush administration, which supports political diversity but rues the rise of often militant Islamic political movements as the chief alternatives to corrupt or calcified Middle East regimes. Mubarak has ruled Egypt for more than a quarter century and has no designated successor, although critics claim he is rigging the political system to favor his son, Gamal. Authorities have imprisoned hundreds of Muslim Brotherhood members in recent months, and last fall an Egyptian court sentenced the editors of four outspoken tabloids to a year in prison for defaming Mubarak and his ruling party. The sentences have been appealed. The government has also targeted organizations unrelated to the transfer of power. Authorities closed the Association for Human Rights Legal Aid, which had been involved in the first lawsuit against a state security officer for torture. Egyptian officials said the group had received funding without the necessary permission, but fellow human rights groups said the closure was related to the torture case, which ended with the officer's acquittal on Sept. 5. Egypt welcomed the start of new Israeli-Palestinian peace talks at Mr. Bush's behest late last year. Although Mr. Bush says the six-decade fight needs to be resolved for its own sake, he was also swayed by Egyptian arguments that the conflict had become a dangerous source of regional instability. Egypt, longtime partner in Mideast peacemaking and the second-largest annual recipient of U.S. aid, was meant to be a test case for Mr. Bush's push for greater democracy in the Middle East. U.S. Secretary of State Condoleezza Rice chose Egypt as the site of a major challenge to Mideast leaders in 2005 - after delaying her trip to protest Egypt's treatment of a prominent political opponent. The U.S. cheered a season of relative political openness that same year, including Egypt's first multiparty elections, but as the Mubarak government retrenched the U.S. finds itself without many friends here. In a sign of the cool official U.S.-Egyptian relations, most Egyptian newspapers friendly toward Mubarak's government have downplayed Bush's trip. The visit was mentioned only briefly on front pages of major newspapers in Cairo on Wednesday, just hours before Mr. Bush arrived. Meanwhile, democracy activists whom the U.S. had encouraged say their aims have taken a back seat to politics. They blame Washington for easing its pressure on Mubarak to win his support on key regional issues such as Iraq and the Israeli-Arab peace process. The United States and Egypt retain strong ties that include cooperation against Islamic extremists and billions in U.S. aid. The Bush administration proposed a new 10-year, $15 billion aid package earlier this year, but there is a move in Congress to hold up some money. House members said Egypt must curb its police abuse, reform its judicial system and stop arms smuggling into the neighboring Gaza Strip.